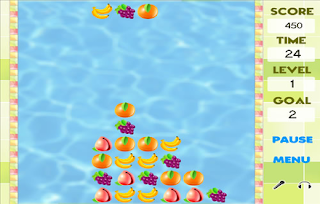 Arrange the falling fruits so that you can get a group of at least three similar fruits in a line — vertical, horizontal or diagonal. Each time you get at least three in a row, that row will disappear from the board, leaving more room for your next fruits. If a column reaches the top of the board, you lose.